The concept behind the Sustainable Interior Design revolution emphasizes design values such as functionality, accessibility, and aesthetics while expanding the focus to include environmental considerations. Such projects are influenced by factors including planning efficient use of space, choosing materials with low environmental impacts, and reducing energy consumption, pollution, and waste. 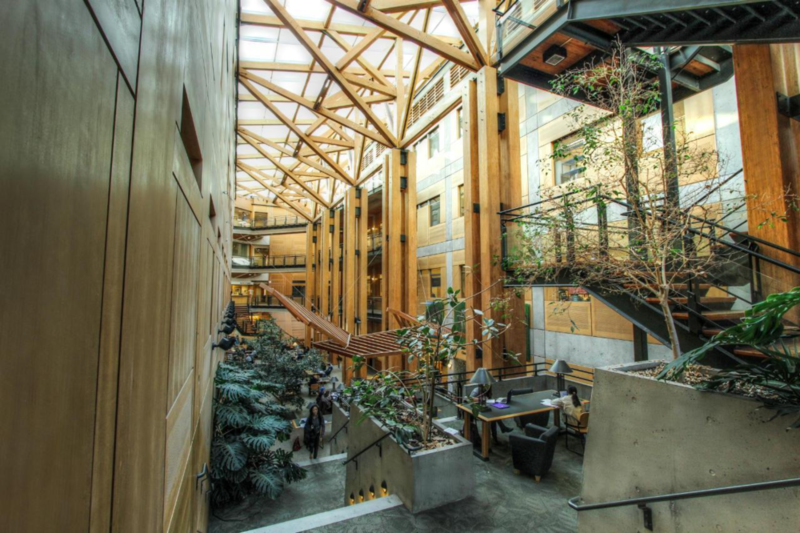 The University of British Columbia not only teaches Sustainable Interior Design courses, but it also places sustainability at the heart of its operations and infrastructure. Strategies like The Green Building Action Plan and UBC Okanagan’s Whole Systems Infrastructure Plan use the built environment to contribute to a net-positive campus that promotes human and ecological well-being. Sustainable interior design considers the interactions between human and natural urban systems and draws inspiration from local and international examples of successful sustainable community designs. The benefits of implementing sustainable practices in the design of infrastructure are immense. Not only are there myriad positive effects on both the environment and people by reducing exposure to toxins and pollution, but sustainable products (typically) are made with higher quality practices and materials meaning they last longer than their counterparts. Another significant benefit is that sustainability increases brand image which has been supported by the increasing evidence that shows how sustainability has become a competitive tool for businesses. While this may seem like a self-serving benefit, it’s considerably pertinent to institutions like UBC who compete on a competitive global platform. UBC has taken leading steps in building more environmentally sustainable and eco-friendly buildings that have been approved by a third party called Leadership in Energy and Environmental Design (LEED). LEED is an internationally accepted benchmark for design, construction and the operations of high-performance sustainable buildings. Since 2008, UBC has been committed to the construction and renovation of buildings mandated by the LEED Gold Standard. However, by taking this one step further and incorporating more environmentally sustainable decisions into the interior design, the decor and the furniture, UBC will be fostering the revolution of a new environmentally mindful generation of students. By incorporating environmentally mindful elements into the design of the buildings, the interior decor, and the furniture, gaps between awareness and behaviour becomes smaller—when people are exposed to pieces of nature, people become more aware of their environmental footprint. In general, this fosters a positive reaction to the way that the building, resources and furniture is treated while simultaneously leaving a positive reflection and connection with the environment. Canada's largest forestry school and a leader in education and research for the conservation and sustainable management of forests, forest products and natural resource systems. Cradle-to-Cradle is a sustainable strategy that mimics the regenerative cycle of nature in which waste is reused. The goal of this approach is to create a cyclical process of reusing, instead of a linear approach, such as the “cradle to grave.” The main objective is to eliminate waste altogether. The underlying design of the cradle to cradle approach examines how a product is made and assesses the impact this will have on the environment. Although some waste is produced, the intention is to have this waste feed into a new process. This is referred to as the “closed loop system.” Such products tend to use little or no harmful chemicals in their creation and are more often produced by local suppliers. Additionally, it has been argued by environmental scientists that supporting smaller-scale economies are an integral part of the solutions that provide for our long-term existence on this planet. Incorporating natural elements, like wood, plants, light and colour schemes not only help you implement sustainable products in the space, but they have correlated effects for reducing stress and bettering mental health. According to Stanford researcher Gregory Bratman, “nature scenes activate our parasympathetic nervous system in ways that reduce stress and autonomic arousal, due to our connection to the natural world.” For example, office workers with windows facing natural scenery have reported higher job satisfaction and less workplace frustration. When a recent study added brain scans into the mix, nature walks were shown to reduce activity in the subgenual prefrontal cortex, a brain region associated with depressive rumination. Painting walls white and green even have powerful impacts on mental perception. Green, for example, promotes a love of nature, the space, and the people within it. From a colour psychology perspective, it is the great balancer of the heart and the emotions, creating equilibrium between the head and the heart. This not only fosters a balance within those using the space but strengthens the relationship that humans have to their workplace and thus the environment. By connecting approaches such as colour psychology, cradle-to-cradle and opting for natural elements to the already founded schools of thought in environmental sustainability, the progress towards a more holistic approach and mindful behaviour becomes more attainable. This paves the way for a Greener future and prepares current and future generations to adapt these initiatives and behaviours into their lifestyles. Environmentally mindful interior design is not new but it has been gaining traction slowly in recent years. Cities like Vancouver compete to be titled the “World’s Greenest City” and have sourced architects and designers from all over the world to help in the infrastructure and city planning to ensure it’s buildings are breaking new records for environmental mindfulness. Last year’s Interior Design Show demonstrated how this trend has taken roots in Vancouver. You can see our review of the event and some honourable mentions of sustainably mindful companies. With UBC’s reputation as an exceptional university, it has the power and status to promote sustainable interior design. Not only does the reputation continue to be grounded in their academic and research experience, but their ability to exhibit exceptional leadership in one of the most challenging policy realms of today’s times is truly inspiring.